Mumbai, March 14th 2017: More than 200 artists and art students from across Pune were roped in by Kokuyo Camlin Limited in an initiative with the Central Railway to paint certain designated sections at the historic Pune Railway Station. Keeping up with its legacy of popularizing art among the masses, Kokuyo Camlin joined hands with Central Railway to beautify Pune Railway Station. The artists and art students painted art and personalities on the theme of Pune’s glorious and rich heritage. These works of art were created on March 11-12th 2017. These beautiful paintings were unveiled at a glittering function at the Pune Railway Station today and were graced by senior Railway authorities. Shri Malojiraje Chhatrapati, Honorary Secretary – All India Shri Shivaji Memorial Societies was the chief guest for the occasion. The young budding artists from various art institutions showcased their creativity in specially designated rooms including the `Ladies’ and `First Class Waiting Rooms’. Adding to the grandeur were 4 large paintings created and put up at the main entrance lobby of the station so that the common man can see and enjoy these works of art. Image I - L-R – Central Railways and Kokuyo Camlin came together in a unique initiative to create an aesthetic feel to the Pune Railway Station. More than 200 art students from across Pune participated in creating paintings to be showcased at the station. 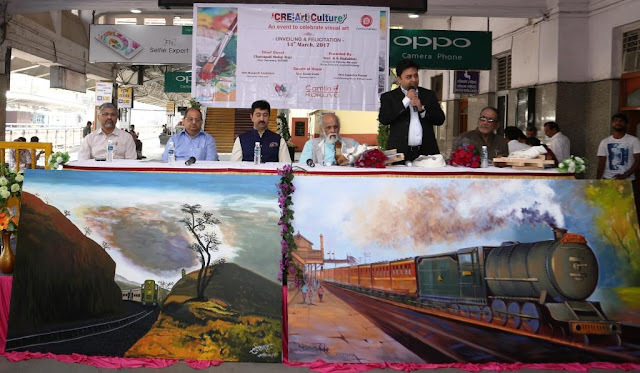 In a function held on the platform of the Pune Railways Station to unveil these paintings is Saumitra Prasad - Chief Marketing Officer - Kokuyo Camlin speaking on the occasion of Camlin joining hands with Central Railway to beautify Pune Railway Station. Also seen the picture is B.K. 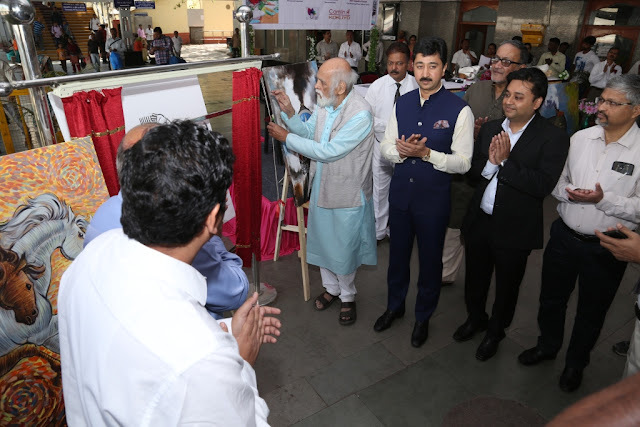 Dadabhoy - Divisional Railway Manager from Central Railway, Pune, Shri Malojiraje Chhatrapati, Honorary Secretary – All India Shri Shivaji Memorial Societies, Mangesh Tendulakar - renowned cartoonist and Jayant Joshi – renowned artist.